Ive been reviewing two popular posts on the blog, one on the customs and traditions for keeping Navarathri Golu, and the other for easy Navaratri Naivedyam and Sundals. 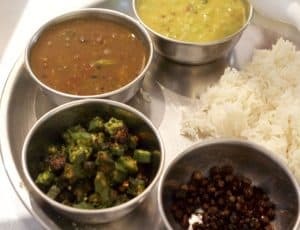 In the second post I had suggested a different Sundal to be made for each day of Navarathri, with recipes for some of them. Now I am adding a recipe for one of the sundals I had suggested, viz Black Eyed Peas Sundal or Karamani Sundal. This is a traditional recipe as followed in Tamilnadu, and has a minimum of seasoning and ingredients. You will find the recipe for Black Eyed Peas Sundal simple and easy to make. Just take the time to soak the karamani the previous night so that it cooks just right when you need it the next day. If you plan to make the Sundal in the evening, set it to soak in the morning so that it gets about 7-8 hours of soaking time. As I had said earlier, this is a traditional recipe with few ingredients and depends on fresh coconut for flavour. For a change in taste, substitute fresh chillies for dry red chillies and add coriander leaves and freshly squeezed lemon juice. Lemon juice may be used in addition to or instead of the coconut. 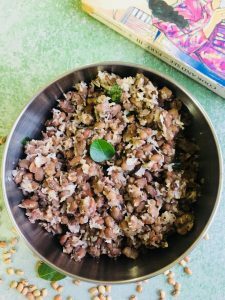 The Black Eyed Peas Sundal adds to the varieties of sundals offered as naivedyam for Navaratri Pooja and served to guests who visit the Navaratri golu. It also serves as a quick to make and nutritious snack as well as a tasty addition to the tiffin box for school or office. 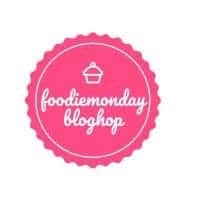 The theme for the FB Group where I am a member, FoodieMondayBlogHop, is ‘Navaratri Special’, and this post fits right into the theme! Though the heat of the summer has been blistering, making it difficult to enter the kitchen, yet the season has its compensations. Bright green raw mangoes can be turned into so many tasty recipes, each being quick and easy to make. 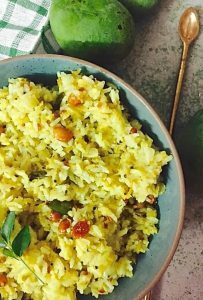 Raw Mango Rice or Mangai Sadam is a favourite with its sharp and tangy flavours. Continuing the series of Pathiya Samayal Recipes or Recipes for the New Mom, Vegetable Koottu – easy to make, nutritious and very tasty – at least thats what Mridula says, and she should know – I’ve been making a vegetable koottu as part of lunch, several times a week during the Post Partum diet. The traditional koottu generally has coconut paste added to it, however for the Pathiya Samayal or food for the New mother, I don’t add coconut. And of course no chillies – in a regular koottu, fresh chilli would be ground along with the coconut, and a red chilli or two added to the tempering or tadka. Pepper is a good substitute for chilli in cooking for the new Mom. Check my post for Menu Ideas and for what goes into a Balanced Meal for the first 40 days after child birth: Cooking for the New Mom Cooking without adding onions, chillies, coconut etc and from only a small selection of vegetables considered healthy for this diet, is not easy, so I have tried to capture my experience in cooking for my daughters, in that post. The vegetable koottu is a South Indian dish, though I don’t know why it is not a Pan Indian one. Perhaps it is because it does not have garam masala and chilli powder s as an ingredient. Or perhaps it is a South Indian derivative of the ubiquitous Dal with vegetables added to the dal. Wikipedia says “Kootu (Tamil:கூட்டு) is a Tamil word means “add” i.e. vegetable added with lentils which form the dish, made of vegetable and lentils and are semi-solid in consistency, i.e., less aqueous than sambhar, but more so than dry curries. The caregiver for the new mother is usually rushed for time in the mornings. As for me, I would go to bed only after planning the lunch menu for the next day. The maalish lady would come at 10 and the baby would demand my attention during the time her mother had the maalish and bath. It was ‘Me time’ for me and my granddaughter for an hour and a half, and I revelled in it. Lunch had to be ready therefore before 10 – a rasam, dal or kuzhambu, a vegetable koottu or a thogayal (vegetable chutney), a sautéed curry or poriyal. I would wash rice and keep the cooker ready so that I could set the rice to cook 10 minutes before Mridula came for lunch. I like to serve food hot, so I would heat the rasam or kuzhambu just before serving, and fry the manathangali (manathakkali) or black nightshade berries in ghee. Here is a link to an interesting article I came across, on the health benefits of this ‘wonder berry’. The vegetable koottu is an integral part of this menu as it is nutritious, adds the protein and vitamin component to the lunch, and tastes so good with either rasam or a kuzhambu/ sambar. The list of ingredients may seem long, but each little condiment or spice adds to the health of the new mother and helps give her a balanced meal or pathiya samayal. The Koottu may be served with chappaties instead of rice. When making Vegetable koottu, choose vegetables that are soft and quick to cook – snake gourd (podalankai), saag (arai keerai), pumpkin (either red or white) etc. Mridula’s favourite is the drumstick (murungakkai) koottu. 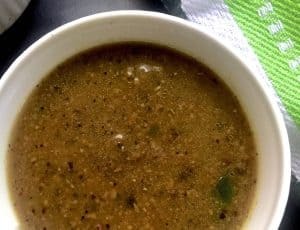 The best dal/ lentils for the new mom, during the 42 days after child birth is the moong dal or pasi paruppu as it is easy to digest and does not cause gas the way thowar or arahar dal would, and adds the protein component to the diet. In fact I observed that even after 42 days when the baby would be better used to mother’s milk, a small quantity of thowar dal in the rasam or sambar would often cause gas for the baby. Red/ Pink masoor dal (Mysore paruppu) may be substituted for the moong dal occasionally, to vary the taste, after the first 2 weeks after child birth. The process is similar for making the vegetable koottu, irrespective of the vegetable used. Boil the lentils and the sliced vegetables with a little salt, asafoetida (hing) and turmeric, add freshly ground peppercorns, mash lightly and temper / tadka with ghee, mustard, fenugreek, cumin seeds and curry leaves. Cooking for my daughter after the birth of my little granddaughter, has taxed my culinary ingenuity to the core. The cooking is not the problem, each dish I make is easy and takes very little time, as I use vegetables and lentils which cook fast. The condiments I can use are limited too so the recipes are straightforward. The challenge is to make nutritious food that will perk up the appetite, and at the same time not contain chillies or anything hot, spices, coconut, onion or any vegetables that can form gas affecting the mother and the baby, and anything difficult to digest. And of course vary the tastes and flavours so that it is not repetitive. Add to this the fact that my daughter does not like milk or curd, and you will see why this milagu kuzhambu is such a life saver. The milagu kuzhambu that I have described here, is from the traditional recipes for making the kuzhambu, tweaked to suit the pathiya samayal or balanced diet given to new mothers after delivery. 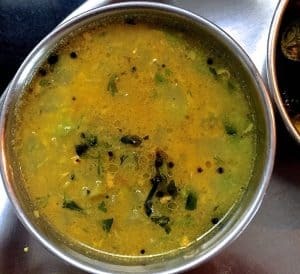 milagu kuzhambu or pepper sambar (if I can call it sambar when there are no lentils, tamarind extract or sambar powder) is basically a paste of sautéed pepper and curry leaves as well as fenugreek seeds, cooked in water and tempered with mustard seeds in ghee (clarified butter). Taken with rice, it is high on flavour and taste. Every ingredient in this milagu kuzhambu contributes to the new mothers well being. Pepper, turmeric, curry leaves, mustard seeds, fenugreek seeds and ghee – the whole forming a nutrition power house just right at this stage. 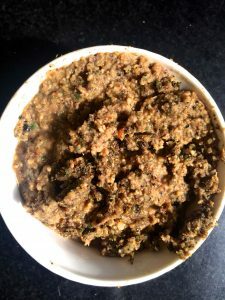 The milagu kuzhambu I made two days after the delivery did not have tamarind, but after that I added a small piece of tamarind while grinding the paste for the milagu kuzhambu. The flavour of the pepper comes through strongly in the milagu Kuzhambu, though the potency and freshness of the pepper used would determine the strength of the flavour. I enjoy making recipes like this one which follow traditional practices that contribute to the health and well being of the new mother, and at the same time are both easy to make, quick to prepare, and oh so delicious! As the milagu kuzhambu is for the new mother, the ingredients do not include red chillies, tamarind extract, chilli powder or towar dhal (pigeon pea lentils). Garlic may be added to the paste if desired. Or as this is given frequently during the 40 days after delivery, you could vary the recipe by adding garlic or not. Initially I sautéed the ingredients for the paste with ghee, and then after a few days switched over to sesame (gingelly oil) and continued to temper the mustard seeds in ghee. Sesame oil suits these traditional Tamil recipes the best. However if you don’t have or don’t use sesame oil, use sunflower oil instead. Check my post on ‘Cooking for the New Mom’ for Diet Plan/Menu for the period immediately after Delivery, and for recipes to various items in the menus. Post partum food can be very tasty and need not be bland!